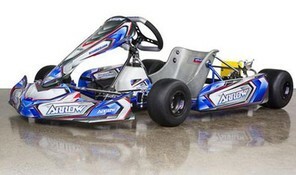 The Arrow X3 was designed to improve overall stability over its predecessor the X2 CIK. The rear grip has improved due to its softer chassis design. In addition, the stock setup of an Arrow model has never been stronger. Concentrate more on driving and less on tuning with the X3. The X3 sports a new adjustable foot rest as well as slotted axle cassettes for easy seat strut installation. The model has already achieved the highest level of success in the North America after placing 1st and 2nd in TAG Senior at the 2013 Supernationals in Las Vegas. Victories in major karts events on all three tire brands (MOJO, MG, Bridgestone) has solidified the X3 as a winning chassis. Designed for ages 12 and older in the Junior, Senior, and Masters categories. The model performs best in higher horsepower TAG classes but is an excellent chassis for the low horsepower KT100 classes as well. X3 has plenty of chassis adjustment and has won on MG, MOJO, and Bridgestone tire brands. 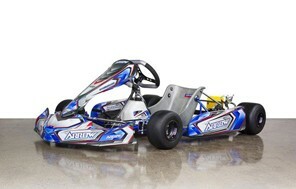 Arrow's kart designed for gearbox racing classes. Designed for ages 12 and older in the Junior shifter, Senior shifter, and Master shifter categories. The new Arrow X4 offers a completely different frame design from its predecessors the X2 and X3. More info to come upon official release. Designed for ages 7-12 in the cadet and rookie categories. Run this chassis in Yamaha KT100 cadet class, Briggs LO206 cadet, Micro and Mini Max rotax classes, as well as the Mini Rok category. Performs well on MG Red, Bridgestone YLC, and MOJO D1 due to its wide range of adjust-ability. 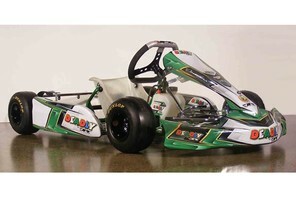 The DEADLY kart line was launched after one of Australia's leading kart racers of all time David Sera. 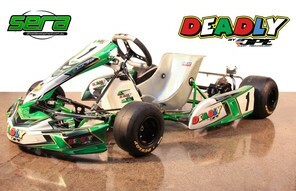 The DEADLY Vegas model is an identical model as the Arrow X3 CIK with the exception of the frame color and overall graphics scheme. The model has already achieved the highest level of success in the North America after placing 1st and 2nd in TAG Senior at the 2013 Supernationals in Las Vegas. Victories in major karts events on all three tire brands (MOJO, MG, Bridgestone) has solidified the X3 a winning chassis. In addition, the DEADLY kart recently scored its first pair of victories at the 2014 USPKS Beaverun event in both dry and wet conditions in TAG Sr. The new Deadly SERA offers a completely different frame design from its predecessors the X2 and X3. 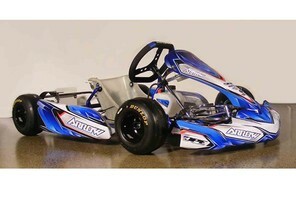 The chassis is identical to the Arrow X4 Cadet. More info to come upon official release.